As our passion at Innovision Boats is spending as much time on the water as possible, we have developed a serious trailer boat set up for cruising. 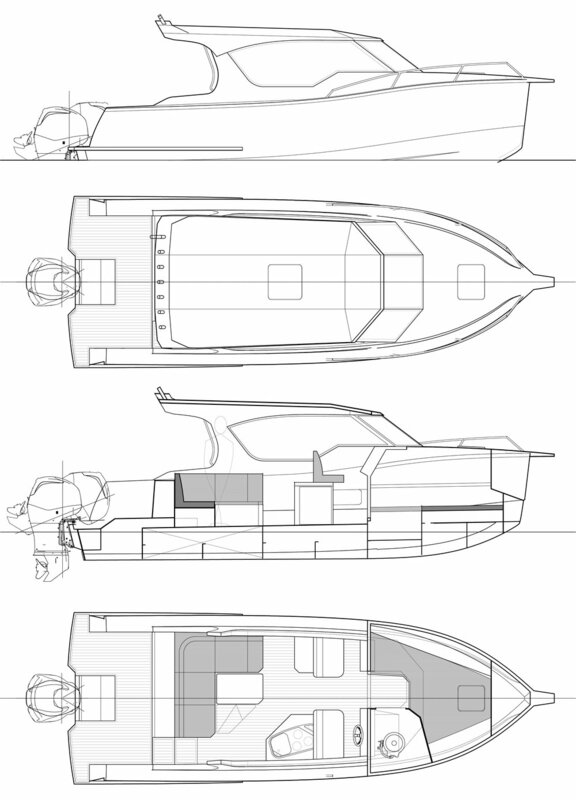 You have the option of a diesel stern leg or Outboard set up, and vairous layout options to suit your needs. The accommodation options include a full double or V bunks up front and a cockpit L-settee that turns into a double bunk meaning you have accommodation up to 4 adults and 2 children. Our Sedan range has all the luxuries of a mariner boats but with the flexibility of being able to tow it to your favourite spots. This includes fresh water with gas califont so you can have hot showers and enclosed flushing toilets for privacy. The galley features a two hob gas burner, fridge/freezer and plenty of storage. The L-settee if fully upholstered for comfort and is a great area to relax or entertain friend. There is plenty of storage under the seats and behind the backs. At the end of the night the table drops down to form part of the cockpit double bunk. Depending on the size you are after, this range has been designed with ample room to fit 4-6 fishermen comfortably without compromising the rest of the boat. There are two large lockers under the floor of the transom. The hatches have a gutter to keep the water out, but have been design as a wet storage locker so water from wet dive gear, wet suits will be pumped out. Overall this boat has been designed so you can stay out on the water for as long as you want with all the luxuries you need. With the ability to tow the boat all over the country it opens up your options for boating holidays - from the South Island sounds and fiords to the North Island harbours and islands, you can experience it all with this boat.